A mature adult life and healthy marriage begins with leaving home. I don’t mean simply moving out and living in a different house, paying your own bills, and maintaining your own social and vocational life. Many 16-year-old teens can do that. To truly become a mature adult who can contribute to a healthy marriage, we must leave home on a much deeper level. We must leave home emotionally. For some, the task of leaving home emotionally is relatively simple. For others–those who have experienced neglect, abuse, or abandonment–this task can prove monumental. Leaving home emotionally necessitates that we face the realities of our childhood, forgive our parents for any shortcomings they might have exhibited, and embrace the love they did share with us during our life. Forgiving our Fathers and Mothers by Leslie Leyland Fields and Dr. Jill Hubbard provides a tremendous map for doing just that. The guidance they offer in their book guides the reader out of the prison of pain, bitterness, and resentment that traps many who grew up in abusive homes. It is filled with courageous stories and insightful strategies to help lead the reader out of the common behaviors used to run from the pain, “reclaim the past,” and enter into a “land of freedom.” The stories are inspirational yet tempered so we can all learn the lessons they offer. The insights are wise and practical. The way to freedom, though filled with ups and downs, pain and healing, struggles and victory, passes through forgiveness and into the land of peace and wholeness. 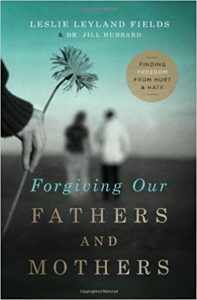 If you have experienced trouble leaving a traumatic childhood behind, Forgiving our Fathers and Mothers offers hope and practical guidance. Following the strategies offered in this book will lead you into the freedom of a whole life and a fulfilling marriage.